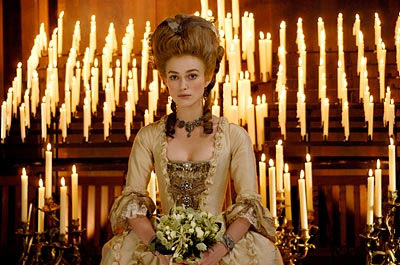 The movie is The Duchess and stars Keira in the title role directed by Saul Dibb, the book by Amanda Foreman. Georgiana Spencer was born June 7, 1757, the daughter of John Spencer, 1st Earl of Spencer. Georgiana, known for both a lavish sense of style and politically active lifestyle married William Cavendish, 5th Duke of Devonshire June 6, 1774. Politically they were both members of the Whig party, but in personality, William and Georgiana was very mismatched. This relationship was satirized in a play called School for Scandal which was first performed in 1777. In terms of political campaigning, Georgiana was most known for campaigning for her distant cousin and member of the Whig party Charles James Fox. In the election of 1784 Georgiana was rumored to have traded kisses for votes. Georgiana did not have children right away which was a scandal in itself. Her first two children were born in 1783 and 1785, both daughters. Finally in 1790 she gave birth to a son, William George Spenser Cavendish, 6th Duke of Devonshire, who died unmarried. Lady Elizabeth Foster was one of Georgiana's best friends, often called "Bess." Georgiana introduced Bess to her husband, and she became his mistress as well as his second wife after Georgiana died. Georgiana had her own affair that almost caused a divorce between her and her husband with the later UK Prime Mister and Whig member Charles Grey, 2nd Earl Grey, by whom she bore a daughter in 1792, Eliza Courtney. In 1806, the lavish, political, and stylish Duchess Georgiana died deeply in debt as a result of her love of gambling, despite the wealth of the Spencer and Cavendish family. In the biographical film, 2 time Oscar nominee Ralph Fiennes stars opposite Keira as the mismatched husband, The Duke of Devonshire. Playing the role of mistress and affair-mate Dominic Cooper plays Earl Grey, while Hayley Atwell plays Bess. Simon McBurney plays politician Charles James Fox, and Aidan McArdle plays playwright Richard Brinsley Sheridan. Certainly it's not uncommon for lead actresses in lavish historical features to get critical acclaim, but not all do. Will Keira Knightley receive critical acclaim and perhaps recognition from the Academy for her portray of this Real (Reel) Person? 3. In the benning, she's Emily Blunt like competence in a better(Unleast on paper) film; now she has another contender; the overdue Michelle Pfeiffer in "Cheri". I have just read two reviews for "The Edge of Love" and she is not going to be recognized for that film. They say she is good, but it is a screenwriter/director problem. What people tend to forget is Knightley is only 23 and really does not care about racking up another Oscar. From what I can read in reviews she is still shocked she has been nominated at all. She could be nominated for this, or perhaps the Academy may want to see what she can do out of period before bestowing another nomination.